This year my focus in the classroom is building positive relationships. 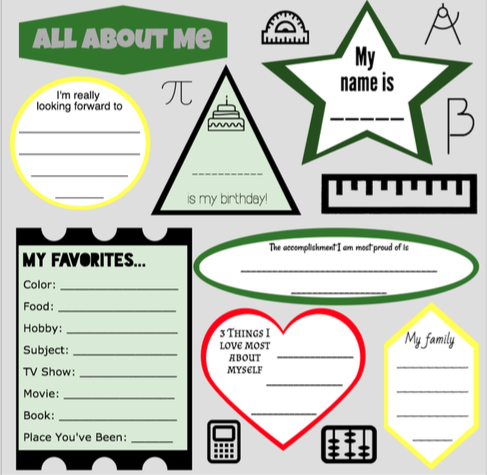 I believe that I have always worked on creating a relatively positive environment for students to feel comfortable sharing their thoughts with me, whether these thoughts were personal or academic in nature. The problem with that last sentence is 'with me'. Yes, it is incredibly important for teachers to get to know their students, build a positive rapport, and care about them as an individual. Towards the end of last year, however, I realized that I have never set an expectation for my students to build relationships with one another. I decided to change that going forward. The first change was in the works during second semester of last year. No more desks! If I expected students to work together by communicating and collaborating with one another, I needed to have a physical environment that would foster this teamwork. I now have whiteboard tables (which are amazing! ), and there will be more blog posts about this resource in the future. 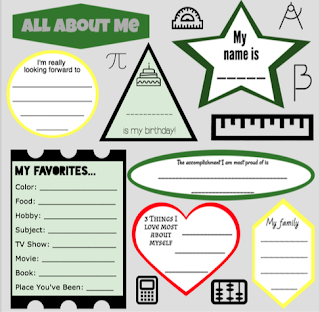 This year, I created a new All About Me activity using the website Piktochart. More information on how to create or use infographics can be found here. Students accessed this document electronically via Schoology and annotated using Notability. Then, students were asked to share any one of their 'favorites' with their group. At the end of the first day, they were then asked to share a different 'favorite' with the class. 1) What were your grades last year in math? 3) What are your plans after high school? 4) What are your future career goals? I have looked over these replies and will have one on one meetings with each student over the next couple weeks. During these meetings, I am going to have students fill out the following card, which will be stapled to their portfolios. This way, every time we go over assessments, students will be able to look at their goals and reflect on them. I am still brainstorming ideas of how best to document these student refections, so if you have any ideas, please share! This biggest component of all these activities was that I want students to be comfortable by allowing for student voice in the classroom. They get to determine what they share with me and what they share with the class. For example, I let them choose their 'favorite' with the class. I could've said that everyone needed to share their favorite color, but instead I wanted to see what my students wanted to share about themselves. I will be documenting more of my encouragement of student voice and building relationships throughout this year's blog posts. So many good ideas here! Thank you for sharing. 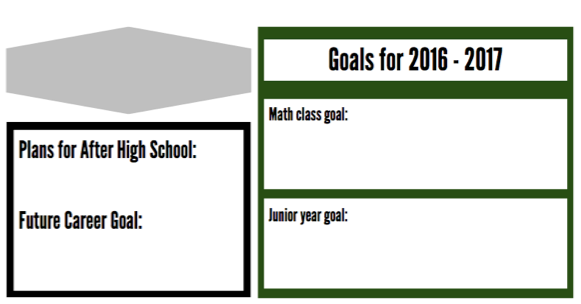 Can I ask how you made the goals graphic? What app did you use? Love the idea of stapling it to their work folders. Definitely stealing that idea! I used Piktochart. We could set up a meeting and I can show you!